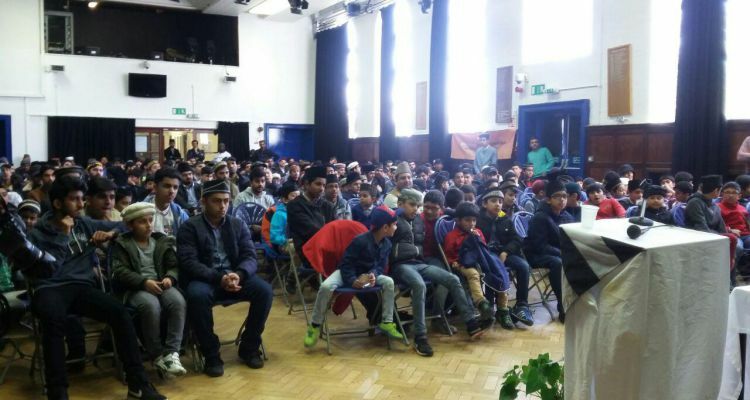 By the grace of Allah, Masroor Region held its annual regional Ijtema on Sunday 2nd April at the Raynes Park High School. The day started with registration and breakfast. The opening session started at 10:30am, and was chaired by Sadr Majlis Khuddamul Ahmadiyya UK Sahibzada Mirza Waqas Ahmad Sahib. This session started with recitation of the Holy Qur’an and its English translation, followed by pledge and Nazm and its English translation. After this Sadr Sahib spoke on the importance of the Ijtema, and this year’s theme ‘The Holy Qur’an’. The session concluded with silent prayer. After this, the Atfal went into their allocated area for their academic competitions, while Khuddam stayed in the main hall for their academic competitions, which lasted until 2:00pm. After this Namaz Zuhr and Asr were led by Maulana Rana Mahmood ul Hasan Sahib. Following this Atfal went to have lunch, while Khuddam stayed back for a Tarbiyyati session, led by Noman Khawaja Sahib from the Rishta Naata UK Department, touching on Islamic marriage and current trends in the UK. After this Khuddam also went for lunch. After this, Khuddam and Atfal made use of the Finance desk and the Rishta Naata desk to gain further information. At around 3:30pm the final session started. This was chaired by Mohtamim Maal Farooq Mahmood Sahib. This session included the recitation of the Holy Qur’an with its English translation, the pledge, Nazm, a brief Ijtema Report, and the Prize Distribution. Afterwards, the chairman spoke to the attendees on the key facts and importance of Holy Qur’an. This session concluded with silent prayer. The Region held its sports competitions ahead of this Regional Ijtema. The attendance at this Ijtema was a total of 549 (70%) with 335 Khuddam and 234 Atfal.